"Soto ajam" means chicken soup in Indonesian. This is going to be a lengthy recipe, but if you're short on time, there is room for a few short cuts. Like using stock cubes, and chicken breast meat. But, as with almost everything else, it's way better if you make it from scratch. This is my favorite way of making chicken soup. Typical Asian ingredients, like lime leaves, lemongrass and ginger, make this soup incredibly flavorful. The stock is rich and fatty and...oh, please, try this recipe. It is SO worth it! I am a lucky girl. Only ten walking minutes from my house, is a slaughterhouse that slaughters old organic laying hens. They sell these in their shop for only € 2,50 (which is about $3,45). I don't think that's a lot of money for a whole 2.5 pound organic chicken. The downside is, that these old laying hens are not suitable for regular cooking. They're tough and stringy if you try to cook them in the oven for an hour. But, they're incredibly suitable for stewing. What I usually do on a lazy sunday, is take two chickens, cut them in half, put them in two pans and cover them with water. I bring it to a boil, cover the pans and let it simmer for 5 hours. I take the chickens out of the stock, let it cool a little and pick the meat off the bones. I use this meat for soups, but also like to fry it in some fat and put it in salads or make lettuce wraps with it. The stock, I freeze in quart sized (1 L.) portions, so I quickly have some home made stock available whenever I want to make a quick soup. This way I hardly ever have to use the stock cubes. The stock is, when cold, pretty gelatinous, which is a sign that you can make a good bone stock from one soup chicken. So, if you can lay your hands on a cheap laying hen (and they're usually sold as "soup chicken"): don't think it's only for soup, you can use the meat for much more. Just don't try to bake them in the oven. It will fail (I learned this the tough and stringy way). Now, back to the recipe. 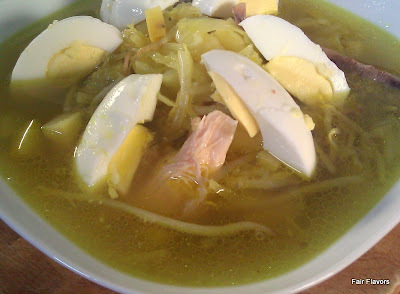 The original Indonesian recipe for Soto ajam includes potatoes and glass noodles. I had to paleofy the original, since I still can't tolerate very starchy foods, so I substituted these for rutabaga and carrot cubes. If you do eat potatoes, you can, of course, put them in if you want. If you want to leave a comment on how this recipe is not authentic...I already know. And I really don't care. Even without the authentic ingredients, this soup is still a winner! First, prepare the stock. It's the easy part, it just takes a lot of time. Put the chicken in a large pan, pour the water on top and bring it to a boil. Once it's boiling, don't bother about foam, it will disappear. Just cover the pan with a lid an put on the lowest possible heat for 4 to 5 hours. It needs to simmer really slowly, don't let it come to a roaring boil anymore. When it's done, take the chicken out, let it cool a little and take the meat off the bones. Set aside. Boil two eggs and set aside. Now prepare the flavoring paste. Peel the ginger*, garlic cloves, onion and galanga* (*see note). Put it all with 2 tbsp of water in a (stick)blender or food processor and blend until it's a paste. Put a little oil in a soup pan, add the paste and turmeric and fry for 2-3 minutes on medium heat. Pour in a quart (1 L.) of the chicken stock you just made and stir. Cut the base (where the root begins) from the lemongrass. Cut the lemongrass lengthwise in half. Put the blade of a large kitchen knife flat on it, and give it a good smash (this releases more flavor from the lemongrass. But if you're hesitant to do this, then don't). Put the lemongrass and the lime leaves into the stock and let it simmer on low heat for at least 45 minutes to really get all the flavors going. This is a good time to salt the stock. You have to taste for yourself, just add little by little until you're satisfied. 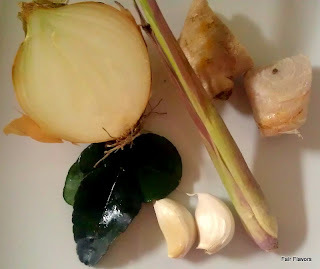 When that stock is done, take out the lime leaves and lemongrass and discard. You can throw in all the vegetables, except the bean sprouts. They only need a minute to cook, so they still hold their bite. Cook untill the vegetables are tender. Add the bean sprouts and cook for another minute. Now it's time to assemble the soup. Divide the chicken meat between two plates. Pour the hot soup on top. Cut the eggs in parts and put on top. If you are brave enough to try this recipe, please let me know how it was. Do you love it as much as I do? *NOTE: Lime leaves, galanga root, ginger root and lemongrass can usually be bought in Asian stores or supermarkets. I always buy in bulk, because it freezes very well. I cut the roots into inch sized pieces and put them in a freezer bag. The lime leaves usually come in a bag which you can put directly into a freezer. Lemongrass also can put directly into a freezer. These roots and leaves can be used for a great variety of Thai, Malaysian or Indonisian soups, curries and stews, so it's good to have some in your freezer.